Rap lyrics are turning up as evidence in courtrooms across the country with alarming regularity. As I argue in my paper, “Rap on Trial,” rather than treat rap music as an art form whose primary purpose is to entertain, prosecutors have become adept at convincing judges and juries alike that the lyrics are either autobiographical confessions of illegal behavior or evidence of defendant’s knowledge, motive or identity with respect to the alleged crime. Yet putting rap on trial has significant implications for how we define creative expression as well as for free speech and the right of all Americans to receive a fair trial. This website is dedicated to bringing attention to the practice of putting rap on trial and to providing resources for those seeking information about these cases. On this page you will find a variety of legal resources for rap lyrics cases. You will also find a list of expert witnesses and legal advisors. On this page you will find scholarly research related to rap on trial, including experimental studies which show the impact of including rap lyrics in criminal cases. The use of rap lyrics in criminal cases has been featured prominently in a variety of news media outlets. Here are some examples. 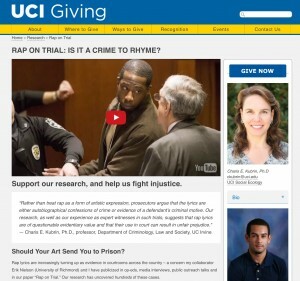 Support research on the implications of the use of rap lyrics as evidence in criminal trials. We have launched an online campaign to fund a series of experiments that test how rap lyrics impact decision making. Click below to learn more.